The MOORE-AYERS line begins with William Moore and Priscilla Ayers. William Moore, born 6 June 1815 in Pennsylvania, was the grandson of Thomas and Eunice Bell Moore of Greene County, Pennsylvania and the son of William and Sarah "Nancy" Moore. William was born about 1790 in Greene County and married his wife about 1811. Her maiden name is unknown and no marriage record has been discovered (but it may have been Barnett, the given name of William and Sarah's first son). 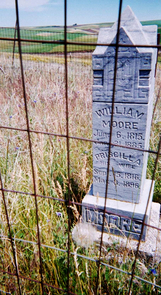 Family oral history maintains that William Moore was accidentally killed by a horse. He and his wife had four children: Barnett, William, Eunice Belle, and John Moore, who may have been born a few months after his father died. William died before 16 October 1821 in Wayne County, Ohio, where his estate was probated. His widow, Priscilla Ayers Moore, subsequently married William Culbertson, who was appointed guardian of her children. Barnett apparently never married, inherited his father's land when he came of age, and may have died at a relatively young age. Eunice Belle Moore married William DePew, who was a descendant of the DePew/DePuy family of New Amsterdam. John Moore married Rebeckah Johnson. William, the second child, married Priscilla Ayers on January 8, 1835 in Wayne County, Ohio. Priscilla was the daughter of David Ayers (1770 - 1819) and Elizabeth Wells (1779 - 1847), and the granddaughter of Moses Ayers (c. 1732- 1803) & Dorcas Cox (1733 - 1814) and Lt. James Wells (1751 - 1826) & Rachel Letitia Leedom (1756 - 1840). According to family lore, Priscilla was a member of a staunch Episcopalian family that was fairly well-to-do for the time. Her family considered William beneath her, both socially and religiously, as he was a Quaker. According to descendant Ethel Moore, "William was a Quaker and Grandma Priscilla was not. Grandma was pretty much of an aristocrat. Her father, David Ayers, was a captain on a river boat on the Ohio Canal. Mr. Ayers took a load of cargo to New Orleans and caught yellow fever and died." Despite her family’s opposition, Priscilla and William married and went on to have ten children together. According to Ethel Moore, granddaughter of William and Priscilla Ayers Moore, Priscilla was a tall, slender, and very pretty woman with dark hair and eyes. She had a beautiful soprano voice and came from a family that was very gifted musically. Perhaps that's a gift that's passed down from generation to generation -- my mother often was asked to sing at weddings and other special occasions. I can still remember hearing my maternal grandmother's soprano voice from the church's choir loft when I was a child. Several of Priscilla's family members also practiced medicine or nursing. Oral family history claims that one of her nephews was an outstanding doctor who practiced medicine in a town on the Ohio Canal. She herself was a practical nurse and it is said that two of her sisters were Red Cross nurses during the Civil War. William and Priscilla Ayers Moore's wedding ceremony took place at Priscilla's mother's home. Their eldest child, Cyrene Jeraldine Moore, was born in the home of her great-grandmother, Elizabeth Wells Ayers (who would have been remarried by that time). After Cyrene's birth, William and Priscilla moved to Fort Wayne, Allen County, Indiana, where they had several additional children. Only Cyrene and Eunice Belle Moore were born in states other than Indiana. Cyrene was born in Ohio and Eunice Belle Moore was born in Iowa. 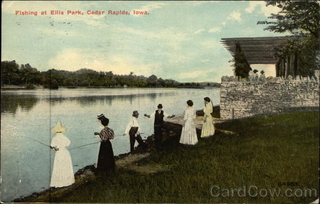 The Moores left Indiana in April 1854 to move to land on the Cedar River, close to Cedar Rapids, Iowa. 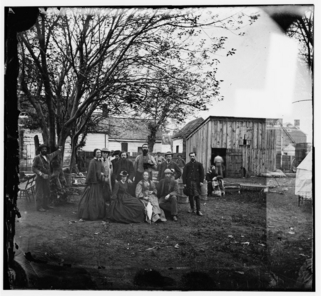 In Indiana, they had lived in an area where sentiment over slavery issues was quite polarized, with many people favoring slavery and states' rights, and many others staunchly opposing slavery. William Moore, a Quaker, was on the side of those advocating abolition of slavery. But was it the political climate that sparked the move? Ethel Moore relates (from stories passed down to her) that the main reason the Moores left Indiana was that Priscilla Ayers Moore didn't get along with William's family. Family history asserts that because of his opposition to slavery and his concern over war, William Moore (the father of several boys who would likely be made soldiers if war came) decided to go to Oregon since it was free territory. He sold the farm in Bremer County, Iowa and began preparations to move west in 1857. The family moved first to St. Joseph, Missouri where wagon trains were assembled and the journey west began. Once there, they learned of Indian troubles on the Oregon Trail, so William Moore rented a farm at Rosehill, Missouri. There was a school in Rosehill, where the school-age children were able to go to school. 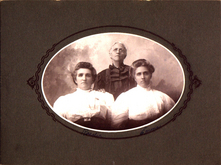 Their eldest daughter, Cyrene, and her husband Daniel Clayton accompanied William and Priscilla to Missouri and their first-born died in Rosehill. Their second son was only a baby when the extended family finally left St. Joseph by wagon train in April 1859. Fifty wagons left St. Joseph. William and Priscilla Moore had two wagons; Daniel and Cyrene Moore Clayton had one wagon. Most of the wagons were pulled by oxen. The captain of the wagon train was said by Moore family elders to have been unable to handle wagon trains. After the wagon train had traveled far into the plains, there was dissention amongst members of the group. Eventually, the problem was solved by the group agreeing to split into two. The wagons pulled by horses went ahead except for the two wagons owned by the Jim Giles family and the Derrick family. Those families stayed with the wagons pulled by oxen. The reformulated group was fairly congenial after the departure of the "horse wagon people." The oxen and the horses were shod, as the Giles and Derrick's horses were having problems with their hooves. Eventually, the "oxen" portion of the original wagon train almost caught up with the "horse" portion, which had gone ahead. Farther along the trail, three young men on horseback approached the wagon train and volunteered to do hunting in exchange for being able to travel with the wagon train. These men were Samuel Colwell, Sam's brother Frank, and John Nifong. These young men also acted as scouts for the wagon train, reconnoitering and keeping watch for hostile Indians. Sam Colwell was assigned to assist William Moore's wagon and in doing so, he met young Priscilla Jane Moore, whom he later married in Walla Walla, Washington in February 1860.
the wagon train's best weapons and rode to the Indian encampment. Someone in the group could communicate - at least to some extent - with the Shoshones. They told the chief that a mare had been stolen and they either wanted her returned or to have the thief turned over to them. The unfortunate thief came sneaking into camp about this time and the men identified him to the chief. Apparently, the young Indian was a troublemaker even within his tribe, so the chief determined where the horse was hidden and offered to have his son and a friend show them where the horse was. They led them to the place and brought the horse to the rescuers. They then accompanied the pioneers back to the wagon train. The young Native American boys were about 12 years old and apparently had fun playing with the children in the wagon train. The wagon train departed after about two days. When it reached the Platte River, the river was flooded. The settlers propped the wagons up to the bolsters and then forced the oxen to swim acrosss the river. Two men went through the river with every team because the oxen were resistent. Water drenched the insides of the wagon boxes, so the wagon train had to stop on the far side of the river to dry out their goods and supplies. When the wagon train reached Fort Boise, there was only a garrison stationed there. The wagon train stopped at the fort to learn about conditions further on. When they reached the Snake River at about the site of present-day Vale, Oregon, they moved the wagons, people, and goods across on rafts. By this point, it was late summer and the river was not very high so crossing was easier than it sometimes was. No doubt it was a much easier crossing than the Platte River adventure, because the oxen were able to hitch a ride instead of having to swim. After crossing the Snake River, the wagon train followed the Burnt River Road to Emigrant Park in northeastern Oregon. By this time, Cyrene Moore Clayton was very ill. She had only recently given birth when the wagon trains left Missouri. Her husband Daniel Clayton had prepared a bed in the wagon for her and the baby, but Cyrene weakened progressively as the journey went on and by the time they reached Oregon, all in the family feared she would die before they got to Walla Walla. William and Priscilla Ayers Moore filed a homestead claim on land southeast of the city limits of present day Walla Walla, Washington. Daniel and Cyrene Moore Clayton also lived in Walla Walla, Washington territory at the time of the 1860 Washington Territorial Census. In an 1867 Assessment and Statistical Roll of Walla Walla County, Daniel was shown as having personal property worth $750. There were 3 males and 3 females in his household. He had three horses, four meat cattle and two hogs; 12 acres of corn, 20 acres of wheat, 14 acres of oats, and 30 acres of barley. By 1880, Daniel and Cyrene Clayton homesteaded land in Columbia County (northeast of Walla Walla County, its parent county) after living near Walla Walla for many years. Cyrene's parents William and Priscilla Moore sold their land in Walla Walla County and moved to Columbia County as well. Their son-in-law Daniel Clayton died in 1902 in Pomeroy, Garfield County, Washington. Cyrene Moore Clayton died January 17, 1917 in Asotin County, Washington. 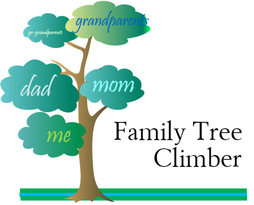 For more information, see: Moore, Carl C. and Dorothy L. Descendants of William Moore. Ye Galleon Press, Fairfield, Washington - ISBN 0-87770-322-1, (c) 1984; see also: Luther, Ellen (Betty). Ancestors and Descendants. Self-published 1998. (Contains history of Moore, Ayers, Cox, Rockhill, and related families). .
William died in Columbia County on January 31, 1885 and is buried in the Turner Cemetery. Priscilla Ayers Moore died in Prescott, Walla Walla County, Washington on March 8, 1896. She was buried next to her husband in the Turner Cemetery in Columbia County. © 2019 Meri Arnett-Kremian. All rights reserved.